Quiozel is a manufacturer of a wide range of lighting. This includes crystal chandeliers, flush mount lighting, bath lighting, and a whole lot more. Quoizel's lighting inventory goes on and on - there at least 2,000 products available from Quoizel that we have access to. If you have trouble finding a particular Quoizel ceiling, floor or wall lamp that you're interested in, be sure to let us know by filling out the contact us form. We will search for the product you're interested in and get it added to the website. The look, feel and appearance of Quoizel lamps and lighting is apparent in most of their designs. They have a unique elegance which you can feel and see in the design and manufacture of their lamps. Quoizel chandeliers are an excellent representation fo this statement. Be sure to leave a review of your favorite or least liked Quoizel product. Let us know why as well. Quiozel is an excellet brand to browse as the product selection of elegant, traditional lighting is easy to love and even easier to install. You can also find modern lighting from this manufacturer as well. Also if you are interested, we have a selection of Quoizel Ceiling Fans available as well. 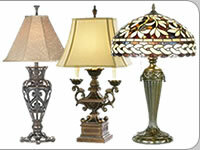 Quoizel's workmanship with their lamps extends to their ceiling fan product lines as well. If you are interested in Quoizel ceiling fans, please chck out that page as well. 44-Inch H; 22-Inch D; (2) 6-Inch and (2) 12-Inch rods supplied for hanging. 44"H; 22"D; (2) 6" and (2) 12" rod. Uses 4 60W Bulbs. Mica Shade. Renaissance Copper Finish. This handcrafted Tiffany style lamp illuminates your home with warm shades of amber, bisque and earthy green, arranged in a clean and simple geometric pattern reminiscent of the works of Frank Lloyd Wright. 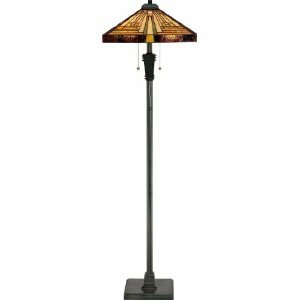 The sturdy base complements the Arts & Crafts style, and is finished in a vintage bronze patina. Finish: Malaga, Glass:Pen Shell Mosaic, Light Bulb:(3)100w A19 Med F Incand The lovely mosaic design on the glass shades is made from genuine pen shell, bringing the beauty of nature into your home. The playful curls of the metal body add a whimsical element to the overall style. Imperial bronze finish with amber glass in calla lily design. 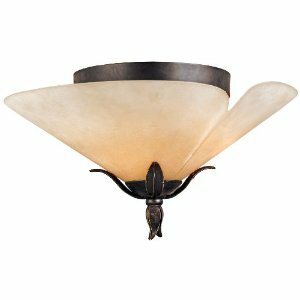 Casual elegance radiates from this decorative ceiling fixture whose bronze-finished leaf accents and large shade of amber glass evoke the exquisite calla lily. 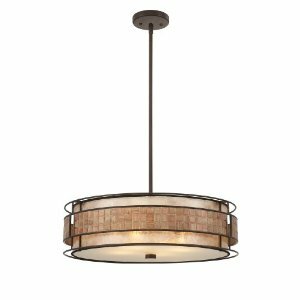 Mounted securely flush to the ceiling it's a delicate piece that warmly lights your way down the hallway or through an entryway. Also a romantic accent for the bedroom. It measures 10-1/2 inches tall by 18 inches wide and takes three 60-watt bulbs. Found back in 1930, Quoizel is one of today's national leading manufacturers of fine decorative lighting and home accessories. 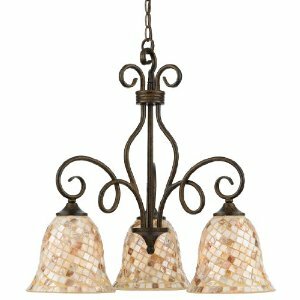 Their diverse line includes pendants, wall sconces, hall and foyer lamps, flush mounts, bath and vanity lights, and outdoor lighting in addition to a series of decorative mirrors, accessories, and interior furniture. After over 80 years, Quoizel continues to provide homeowners across the world with affordable and attractive lighting fixtures. DL # 57267.